The West End neighborhood of Hartford is located in the west central section of the city. It is just west of the Asylum Hill neighborhood at the north branch of the Park River; this river is also its northern boundary. The neighborhood ends at the West Hartford town line at Prospect Avenue. The majority of the neighborhood is residential. Two-thirds of geographical area of the West End’s 650-acre area has single and two and three-family homes that are well maintained with interesting and varied architecture. West End real estate values are traditionally the strongest in the city, as people are attracted to its tree-lined streets of spacious homes built mostly between 1880-1920. Yet most of the West End population lives in rental housing. High and medium density apartment buildings are clustered in the southeast section of the neighborhood, on and near the area’s commercial corridor, Farmington Avenue. 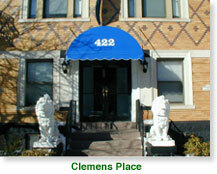 Clemens Place, a 1920’s era complex of 46 buildings, is on tree-lined streets and in a National Register of Historic Places District as is most of the West End residential districts. The West End’s diverse housing stock, ranging from efficiency apartments and rooms in larger homes to mansions, is suitable for a wide spectrum of ages, income and lifestyle, and has resulted in a very diverse population of about 9,000. The West End has a growing student population who attend nearby colleges. Area students create a large demand for the West End’s pizza shops and Chinese restaurants, especially late evenings. The neighborhood’s commercial corridor, Farmington Avenue, caters to automobile oriented and convenience shopping but in recent years local pubs and restaurants have opened up and have thrived. More are planned in the coming year. 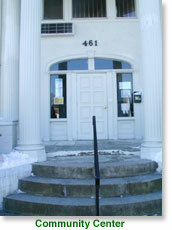 Also on Farmington Avenue are many professional offices and the West End Community Center that provides programs and a place for West Enders to meet. Public spaces – schools, a park, and museum, add to the West End neighborhood. 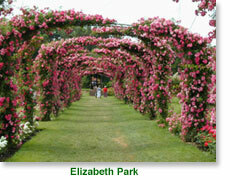 Elizabeth Park, a city park noted for its gardens, is a popular destination for West Enders for strolling, active play on its fields, courts and playground, sledding, dog walking or just smelling the roses. The park’s Rose Garden, built in 1902, has over 12,000 rose bushes and attracts visitors from the region and beyond. Mostly the park is a place where neighbors unwind and meet. Late afternoons there is an informal but daily meeting of dog owners and their dogs on the east lawn! Two schools, Hartford College for Women, which has affiliated with the University of Hartford and the University of Connecticut School of Law, have roomy campuses on the east side of the West End near the Park River. The law school has allowed its front lawns to be used for a neighborhood soccer program and a community garden. Next to these schools is Hartford Seminary, a graduate theological school with special centers for religion research, Christian/Muslim/Jewish studies and ministry in daily life for religious and lay leaders. Also nearby in the Connecticut Historical Society that has a library accessible to the public, long term exhibits such as the story of the Amistad, a ship commandeered by slaves on route to Cuba that landed on the Connecticut nearly 200 years ago.